There are investment aspects of the North American Free Trade Agreement (NAFTA) which considerably enhance the opportunities for foreign investment among the signatories, while at the same time improving the security of such investment. NAFTA reflects the Parties' recognition that liberalization of host country investment restrictions is as important as the elimination of trade barriers. With the assistance of such high caliber contributors as Roberto Mayorga, Kent S. Foster, Preston Brown, and Dr. Jorge Witker, the book analyses both the advantages and disadvantages of this policy upon the investment climate within the countries of the various signatories. 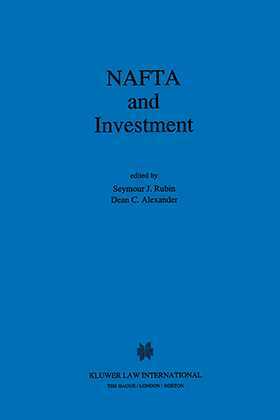 This book is the second volume in Kluwer's NAFTA Law and Policy Series, publishing high-quality studies on different aspects of NAFTA, including legal analysis and commentary on the Agreement. Among the numerous areas that are to be covered in the series are topics as diverse as agriculture, dispute settlement, environment, intellectual property rights, investment, and labour.